April 7 – While the €1 million solidarity payment to each national federation made headlines at the UEFA Congress this week, the real financial story is the €847 million profit the confederation made on its expanded 2016 European Championships, a €500 million increase on the 2012 edition in Poland and Ukraine. The tournament generated a massive €1.92 billion in total revenue. As FIFA focusses on its politics, battles for control and its threatened cash reserves, so UEFA has surged forward post the departure of its former general secretary Gianni Infantino to record a 12 month revenue figure for the 2016 financial year of €4.58 billion. In an ‘Income Statement’ attached to the accounts, UEFA says that a more meaningful way of comparing the financial numbers would be to take a “rolling average” of the four year quadrennial, thus taking out the overweighting balance of the Euros revenue in 2016. Doing this, UEFA’s average revenue is €2.53 billion – still an impressive €930 million growth compared with 2011/12, when EURO 2012 took place. Broadcast revenues are the main driver of growth, generating more than half the income Euros income at €1.024 billion. Total broadcast revenues for all of UEFA’s competitions topped €3 billion, accounting for 70% of the total revenue figure. Sponsorship accounts for 20%. It cost UEFA a record €595 million to stage Euro2016, but that still represented a lower percentage of revenue generated than in 2012. To understand the scale of the commercial growth of football in Europe, compare this to the €40.9 million income generated when the tournament was staged in Sweden in 1992. The distribution of money to teams participating in UEFA’s competitions is by far the biggest cost at €2.27 billion – 50% of total revenue. The 2015/2016 period marked the start of a new three-year commercial cycle for club competitions which again showed an increase in revenue – up by 38% to €2.06 billion for the Champions League and €355.9 million for the Europa League. Very satisfactory indeed. 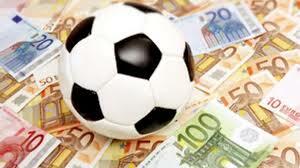 UEFA was holding reserves of €632 million on June 30th last year.